After a long period of inactivity (since 1821), Tyokai volcano blew up on 1 March. Explosions at 1010 and 1130 (0110 and 0230 GMT) were the biggest, and repeated about ten times. Black smoke rose, and the volcanic ash fall lasted for ten minutes. According to aerial observations that same day, the eruption site was confirmed to be located on the eastern side of Sinzan, a central cone of this volcano. 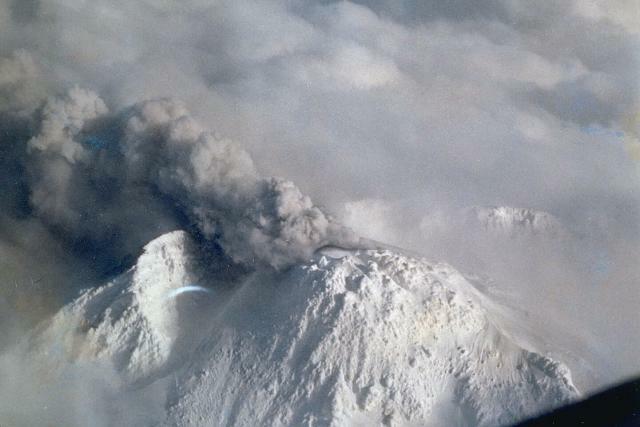 At first black smoke was spewing from the crater, and black ash was deposited on the eastern slope of the snow-covered volcano. According to an aerial observation on 3 March, this black smoke had turned into white vapor. Temporary seismic observations were carried out by the Tohoku University and the JMA around the skirt of this volcano, and scores of volcanic earthquakes were detected. A black belt (about 1.5 km long and 20-30 m wide) composed of ash-deposits and snow flowed down to the north side on 6 March. This belt is considered to be the result of a snow slide and there was no change or re-activity in the volcanic state. Gray volcanic smoke was observed on 5 March from the slope of the volcano, but there was no smoke after that. 1) According to a visual observation on 8 April, and an aerial observation on 15 April, white smoke several tens of meters in height erupted from the new crater on the eastern flank of Sinzan, a central cone of this volcano, and white vapor about 20 m in height erupted from the 500 m long fissure on the western flank of Sinzan. On the fissure about ten fumaroles have formed. 2) On 24 April, black smoke, about several hundred meters in height, rose from the fissure on the W flank of Sinzan, and ash fell on the E foot of Tyokai volcano. On that day this black smoke gradually turned into white vapor. Simultaneously, a mud flow started from the summit crater and flowed down the W side, and this belt reached 3 km in length. Card 1835 (01 April 1974) T. Tiba, Dept. of Geology, National Science Museum, Tokyu, Japan. Card 1850 (30 April 1974) Seismological Division, JMA. The Global Volcanism Program has no Weekly Reports available for Chokaisan. Massive Chokaisan volcano, the largest of NE Honshu, overlooks the Japan Sea. It is composed of two overlapping stratovolcanoes with a conical profile that has given it the local names Akita-Fuji or Dewa-Fuji. The summit of the gently sloping western volcano (Nishi-Chokaisan) is cut by a large horseshoe-shaped caldera breached to the south, whose floor contains lava domes. 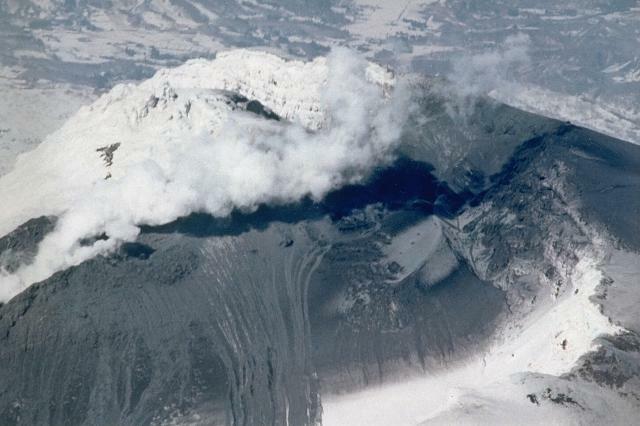 The younger eastern volcano (Higashi-Chokaisan) began forming about 20,000 years ago. It was cut by another large horseshoe-shaped caldera, breached to the north. During an eruption about 2600 years ago it was the source of the voluminous Kisakata debris avalanche, which reached the Pacific coast. Two post-caldera lava domes have been constructed at the upper SE end of the caldera. Intermittent reports of historical eruptions date back to the 6th century CE. Ban M, Hayashi S, Takaoka N, 2001. K-Ar dating of the Chokai volcano, northeast Japan arc--a compound volcano composed of continuously established three stratovolcanoes. Bull Volc Soc Japan (Kazan), 46: 317-333 (in Japanese with English abs). There is no Deformation History data available for Chokaisan. There is no Emissions History data available for Chokaisan. Massive Chokai volcano, the largest of NE Honshu, is seen here from the NE. Chokai is composed of two large overlapping stratovolcanoes. The younger eastern volcano is cut by the large horseshoe-shaped caldera, seen here breached to the north, that was the source of the Kisakata debris avalanche. Pyroclastic cones later filled much of the area near the back wall of the caldera. Chokai has erupted frequently since one of the earliest historically documented eruptions in Japan in 573 CE. Photo courtesy Ichio Moriya (Kanazawa University). The north flank of Chokai volcano was the source of a massive debris avalanche about 2600 years ago that traveled 25 km into the Japan Sea and underlies much of the foreground area. Collapse of the summit left a 3 x 4 km horseshoe-shaped caldera whose eastern rim forms the peak at left center and western rim descends from the cloud bank at the right. Following the collapse a series of lava domes and lava flows filled the upper part of the caldera and formed the center peak. An ash plume rises from the flanks of Shinzan lava dome at the summit of Chokai volcano on March 1, 1974, after a long repose of 140 years. Phreatic eruptions occurred at Chokai in March and April, and were accompanied by small mudflows. The eruptions took place from an E-W-trending series of vents extending from the eastern caldera wall across the flanks of the 1801 Shinzan lava dome and the Kojin-yama cone. This view from the NW shows the eastern caldera wall behind Shinzan. 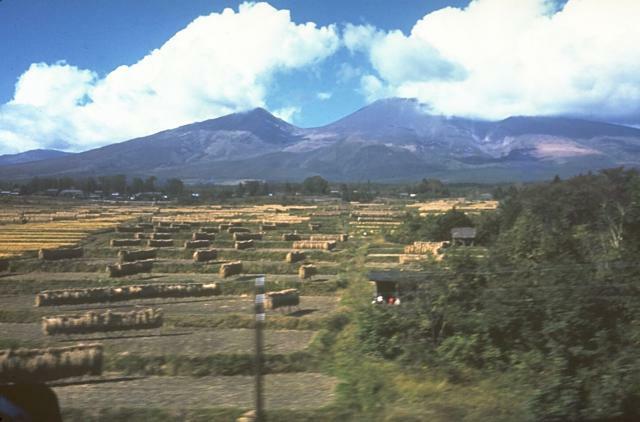 Photo courtesy of Japan Meteorological Agency, 1974. Steam pours from an eruptive fissure on Chokai volcano on April 24, 1974, near the end of an eruption that began on March 1. Ash darkens the slopes of the summit cone and mudflow deposits descend the flanks at the lower left. Shinzan lava dome appears above the steam plume at the left, with the eastern caldera wall in the background, in this view from the SW. 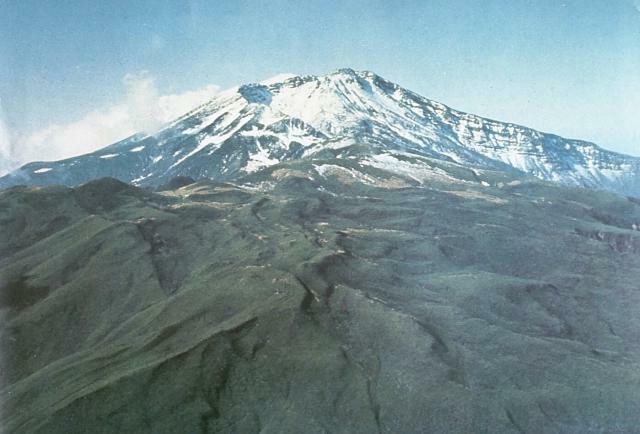 The 1974 eruption, the first from Chokai in 140 years, ended on April 30. There are no samples for Chokaisan in the Smithsonian's NMNH Department of Mineral Sciences Rock and Ore collection. Large Eruptions of Chokaisan Information about large Quaternary eruptions (VEI >= 4) is cataloged in the Large Magnitude Explosive Volcanic Eruptions (LaMEVE) database of the Volcano Global Risk Identification and Analysis Project (VOGRIPA).